The photo accompanying this post is of the most intellectually esoteric item Wal*Mart sells. As I started this Todcast blog, I meant to mock the shirt, the show and the Wal*Mart. While I make no apologies to Wal*Mart, I think the shirt and the show deserve a fair shake. I do not watch Duck Dynasty, nor have I ever. As I understand it, it is a reality show about people who make duck calls. Since I make my home on Maryland’s Eastern Shore, a duck hunting mecca, I appreciate that this is a job as well as a highly specialized craft. Given that whacky beards are no bar to intellect, I elected instead to take the shirt and its implications seriously. What I discovered blew my mind. As I see it, if the shirt is not a cheap attempt at pseudo-cleverness, it is a statement about the nature of language, or religion, or possibly both. If you watch the show, you will know if the following explanations are likely to apply. If you don’t, you can use what follows as a kind of prejudice-against-rednecks-litmus test. I was never a spectacular logic student, but I loved doing it. Much in the way I love to sing but understand no one likes to hear me sing, I love examining the potential (or supposed) precision of language. It is hard to love logic and not have it stick a little bit in your everyday life. You (or at least I) find yourself marveling at the gap between the words people use and what they wish those words to represent. I’m not talking about cliches or idioms, or people using words incorrectly (“literally” comes to mind), I’m more interested in the clear lack of understanding about the way one set of sentences relates to another; implication in the logical sense. In logic there are formulas for what a sentence implies. Once you get the hang of it, you look at a sentence such as “Everything I say is 95% truthful” and see “This sentence is false.” “This sentence is false,” is an important (or at least fun) problem in logic, and the notion the Duck Dynasty people put out a t-shirt for hipster logicians tickles me to no end. ATTENTION: The next paragraph is explanatory and pretty boring. Feel free to trust me on the logic thing and skip it. “This sentence is false” is one of the oldest problems in formal logic because it defies being categorized. It is not a true sentence and it is not a fase sentence. Over the years, logicians have developed explanations they feel rectify this problem. My favorite is the One of the notion that, without context, it is almost impossible to know the truth of most of what we say. By these lights, the t-shirt is a statement about context; a challenge to reevaluate assumptions about truth, not on the traditional truth table, but rather as part of the rich web of language. Moreover, it says truthful, not true. This suggests intentionality AND intensionality! If there’s anything less like formal logic than Zen Buddhism, I’d love to see it. Logic is the mathematics of language (and the mathematics of math, but let’s not go there). It purports to describe how everything we say is related. When logicians see “This sentence is false,” they proffer theories and theorems and proofs for millennia, each trying to provide the most elegant explanation of how the abomination came to be. Some styles of Zen, on the other hand, see it as a koan, an opportunity for mediation. Koans are, for some, the key to enlightenment. If the practice of Buddhism is to free oneself from the bonds of reason, trying to solve a paradoxical problem gets the mind comfortable with the notion that the search for truth, answers and control is the problem, and letting the urge to act, to solve, to dissect, float past is the solution. By these lights, the Duck Dynasty t-shirt is literally iconic. According to some Zen tradition, enlightenment can come all at once, even if you’re not meditating or even Buddhist; it is more about the trigger than the enlightenee. So a person could be walking down the street, see someone else wearing the shirt, grasp its meaning and, BANG, attain enlightenment. That would make the person wearing the t-shirt a bodhisattva (a kind of buddhist demi-god). “Everything I say is 95% truthful” is not commentary on religion or logic. It is the confluence of them. It is commentary on the human experience, which exists between the completely defined and the ineffable. Like a koan, it shakes you from your everyday life and brings you into the moment. Like the logic problem, it draws your attention to context over words and implied over literal meaning. No one who wears the shirt will get it. For all its pretense and high ideals, the shirt mocks the target consumer. I love the notion of crafting a t-shirt people will wear without understanding what it means. 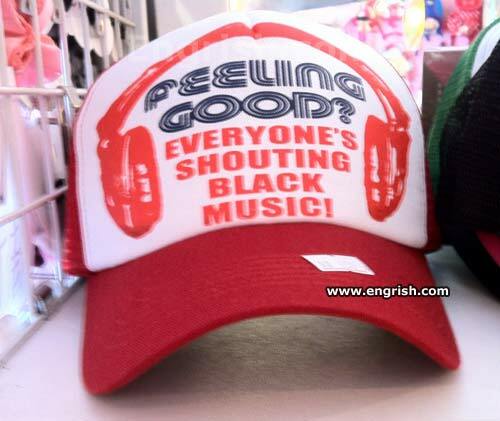 It’s one thing if the words are not in your language, engrish.com style, but another when you could know the meaning and just don’t. The tragedy is, I would never have the courage to wear this shirt. Practically, my redneck prejudice level is still a little too high for me to carry it off unselfconsciously. Also, I look pretty redneck-y as it is and, if I’m not careful, some jerk may pre-judge me just because of the way I look and where I live.